Should Technical Determinism Influence Art Criticism? In the interest of full disclosure: Cory Arcangel, the artist discussed in this post is a client of Small Data Industries, a private practice conservation studio founded by the author. 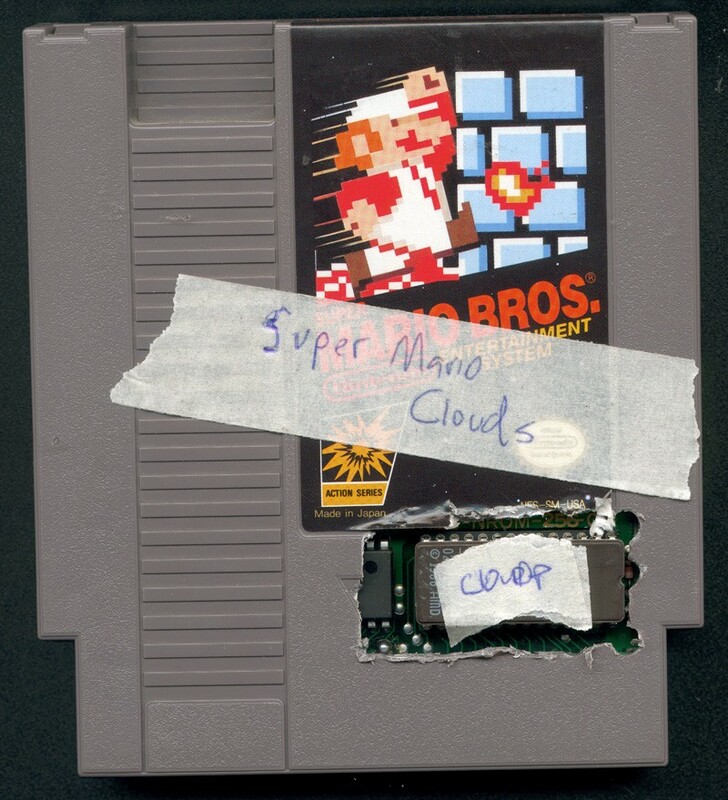 In a recently posted video, Patrick LeMieux(Assistant Professor of Cinema and Digital Media at UC Davis) describes his own material exploration and investigation of Cory Arcangel’s seminal artwork, Super Mario Clouds (2002). LeMieux’s research is spectacular in many ways. It presents exactly the kind of research that I wish I was seeing more of (there are a few examples I can think of) in the time-based media conservation field. Patrick’s in-depth materials focused historic research is something we see in the fields of paintings, sculpture, photographic, and paper conservation. This kind of inquiry adds to our ability to discuss and contextualize the greater whole of an artist’s practice, and in some cases can change the course of art history. So first off, hats-off to Patrick for this incredible example of materials research. This however is where my applause of Patrick’s research ends. The reason that I hope we see more of this kind of research in the conservation field is because conservators and the scientists and art historians and curators they collaborate with, would steer clear of the kinds of judgements Patrick passes. He goes beyond material inquiry and questions the artist’s honesty, ethics, values, and technical proficiency. If the investigator and analyst has a very deep tie to a highly technical area of practice — in this case, video game development and hacking — there is a risk that the investigator will see an artist’s “inferior” technical chops as fumblings and short-comings, rather than autographic style and hand. When conducting this kind of materials research, there is great value in merely presenting and contextualizing the facts, adding to the corpus of history, and leaving the criticism to the critic — especially so when the research is presenting new facts and assertions. For so many great artists in history, myth and fiction (both of personality, and technical proficiency) are fundamental parts of the broader context of their practice. Even though Patrick does underline the affectation present in Cory’s practice, his clearly biased theorizing shows a failure of imagination in that he can not entertain the thought that what he views as deception and dishonesty is part of a larger pastiche of Arcangel’s put-on. In fact, one could argue that Arcangel’s put-on is one that is engaged in a discourse with precisely the kinds of single-minded techno-deterministic perspectives of engineering, hacking, and computer science applied in this criticism of Super Mario Clouds. Who else could do this but an artist with education in computer science and the arts? As someone who has worked in conservation at two institutions, and now in private practice, I can tell you that this kind of discrepancy between what the artist says and what the artwork does materially is incredibly common. Frankly, the public would likely be horrified and feel deceived if they fully understood the behind-the-scenes realities of so many artworks — be it a renaissance painting or computer code.